Along with New German Cinema, the cinema of the Weimar Republic has had an enormous influence on international perceptions of German film. This first German democratic state, which at the end of the First World War succeeded the imperial regime of Kaiser Wilhelm II, enabled film to emerge as a socially significant art form both despite and because of economic, political, and civil crises. An exceptionally high number of German productions from this Golden Age of cinematography have been accepted into the canon of international film history. 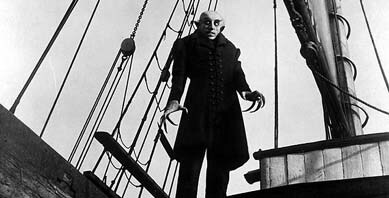 These include many films of undisputed historical significance, such as Robert Wiene’s “Das Cabinet des Dr. Caligari” (“The Cabinet of Dr. Caligari”, 1920), Paul Wegener’s “Der Golem, wie er in die Welt kam” (“The Golem”, 1920),Friedrich Wilhelm Murnau’s “Der letzte Mann” (“The Last Laugh”, 1924), Fritz Lang’s “Metropolis” (1927), and G. W. Pabst’s “Die Büchse der Pandora” (“Pandora’s Box/Lulu”, 1928/29). But “Weimar cinema” cannot be reduced to these and other classics. It is essential to examine the enormous aesthetic, technical, economic, and thematic diversity that characterized Germany’s cinema landscape between 1918 and 1933. The founding of the Universum-Film-AG (Ufa) on December 18, 1917 — shortly before the end of the First World War — marked a decisive turning point for German film production. With its checkered development, the corporation — initially an amalgamation of Messter Corporation, the Union Projektions-AG (PAGU), and the German subsidiaries of Nordisk Film — had a defining influence on Weimar cinema. As the new film company’s first chief executive, PAGU founder Paul Davidson continued his successful collaboration with Ernst Lubitsch, whose 1919 film “Madame Dubarry” was one of Germany’s first successes on the foreign market following the war. No less lavish with his exotic adventure films, like “Das indische Grabmal” (“The Indian Tomb”, 1921) or the initially six-, eventually eight-act serial “Die Herrin der Welt” (“The Mistress of the World”, 1919), was Joe May, who had already shown his talent for expensive productions with the three-hour episodic feature “Veritas vincit” (1919). Along with Ufa, the Decla Film Gesellschaft, founded in 1915 by Erich Pommer, likewise distinguished itself during the early years of the Weimar Republic. Alongside popular films like Fritz Lang’s 1919 adventure serial “Die Spinnen“, Decla’s program included one of the most influential works of film history: “Das Cabinet des Dr. Caligari.” According to an oft-cited credo of the film’s architect,Hermann Warm, “The cinematic work of art must become a living picture.” With his sets for Robert Wiene’s atmospheric drama, Warm was largely responsible for making the term “Expressionism” synonymous with German film, especially abroad, in the 1920s, and to some extent even now.This keyword is often used to describe films as diverse as Wiene’s now-forgotten follow-up work “Genuine” (1920), or F. W. Murnau’s prototypical horror film “Nosferatu – eine Symphonie des Grauens” (1921), or the psychological fairy tale “Das Wachsfigurenkabinett” (“Waxworks”, 1924) by Paul Leni. Within their time, these classic “artistic films” were shown alongside popular genres. These included not only adventure films, historical dramas, and crime movies — the latter based on the detective serials that were already an established form in the 1910s — but, of course, various forms of comedy. There were also period-specific genres, like the sexual and social education film, which included the “social hygiene film” “Anders als die Andern” (“Different From the Others”, 1919) byRichard Oswald, a film that openly decried the criminalization of homosexuality under Paragraph 175. The fact that previously taboo or banned content could be taken up in Weimar cinema is the direct result of a democratization of society and art: on November 12, 1918, the People’s Council abolished state censorship. In the ensuing period, major distributors voluntarily submitted to the decisions of the film assessment board in Berlin, until the “Reich Moving Picture Law” (Reichslichtspielgesetz) was passed on May 12, 1920 and new state censorship regulations were introduced.The aggressive engagement with sexuality and middle class morals likewise characterizes G. W. Pabst’s feature films “Die freudlose Gasse” (“The Joyless Street”, 1925) and “Die Büchse der Pandora”. 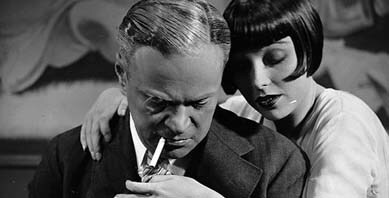 In distinction to the allegorical visual worlds of the Expressionist classics, “Die freudlose Gasse” is sometimes grouped with the later, New Objectivity (Neue Sachlichkeit) works of Weimar cinema. The social realism that these films pursued, however, is subordinated in Pabst’s work to a dramatizing formal intention. Ufa bought out Decla-Bioscop in 1921, and two years later Erich Pommer became its director of production, advancing his idea of a commercially and artistically competitive film industry that thanks to European cooperation could go one on one with Hollywood. And in fact, expensive productions like Lang’s two-part “Die Nibelungen” (1924) garnered prestige and record box-office sales at home. The same year, cameraman Karl Freunddemonstrated an impressive refinement of his dynamic cinematography with the tracking sequences and flights of his internationally renowned “unchained camera.” And with E. A. Dupont‘s “Varieté” (1925), Ufa, under Pommer’s leadership, landed an unquestionable success on the foreign market, which seemed to justify the film company’s penchant for financial risks. But while Pommer and his star directors spared no cost in establishing the “Ufa style” as an international standard, the financial conditions for film production deteriorated along with Germany’s own unstable economy. Attempts to control the domestic market through import restrictions on foreign films proved unsuccessful, as did the cooperation between the underfinanced Ufa and its American competitors Paramount and Metro-Goldwyn-Mayer through the Parufamet agreement. Over the years, numerous filmmakers accepted offers from American studios in order to continue their work under the considerably better conditions in the U.S. Ernst Lubitsch, for instance, left Germany in 1922; Paul Leni and F. W. Murnau both followed not long after. 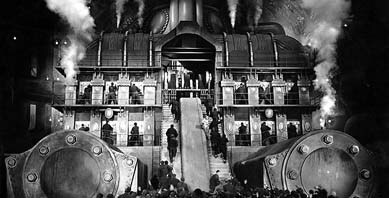 Ufa’s financial crisis came to a dramatic head in January 1927, when Lang’s ambitious, futuristic spectacle “Metropolis” arrived in movie houses. Despite a record budget of 5.3 million Goldmarks, it made only mediocre box-office profits on both domestic and foreign markets. Two months later, in March 1927, a consortium led by the German nationalist media mogul Alfred Hugenberg took over the practically bankrupt Ufa film company, not least as a defense against prospective buyers from abroad. In spite of the dire economic situation, Weimar cinema continually developed new expressive forms. In 1921, for instance, Walther Ruttmann presented his abstract play of forms and colors “Lichtspiel Opus 1” (“Photoplay Opus 1”), which was considered the first “absolute film” in Germany. And in May 1926, the hand-cut silhouettes of the world’s first animated feature film, Lotte Reiniger’s “Die Abenteuer des Prinzen Achmed” (“The Adventures of Prince Achmed”), had their debut. It was under altogether different auspices that the Ufa Kulturfilm “Wege zu Kraft und Schönheit” (“Ways to Strength and Beauty”, 1925) presented its stylized subjects. In 1927, Walter Ruttmann caused another sensation with his documentary montage film “Berlin: Die Sinfonie der Großstadt“, which is also classified as a New Objectivity film. 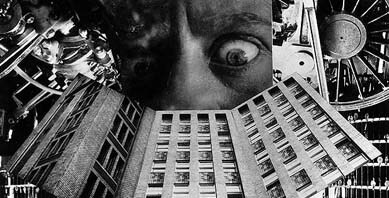 And before the all-encompassing onset of the sound film, Phil Jutzi articulated film’s political potential in “Mutter Krausens Fahrt ins Glück” (“Mother Krausens Journey into Happiness”, 1929), while Robert Siodmak and Billy Wilder together with other experimentally minded artists captured the poetry of everyday life in “Menschen am Sonntag” (“People on Sunday”, 1930).Weimar cinema yielded its creative awakenings and new orientations not only in all areas of film production — whether directing, screenwriting, acting, cinematography, or architecture — but in philosophical and journalistic treatments of film as well: the outstanding works of critics and theorists like Bela Balazs, Rudolf Arnheim, Siegfried Kracauer, and Lotte H. Eisner are both products and reflections of this time. The sound film brought with it not only new technical and dramatic requirements, but new stars — such as Marlene Dietrich in “Der blaue Engel” by Josef von Sternberg— and above all new audiences, which Ufa was able to attract with its musical films. So for example Wilhelm Thiele’s “Die Drei von der Tankstelle” (1930), with lead actressLilian Harvey, provided a prototype for later popular and exportable sound film comedies like Erik Charell’s “Der Kongreß tanzt” (Congress Dances, 1931). Fritz Lang’s first sound film, “M” premiered in May 1931, a production of Seymour Nebenzahl’s independent company Nero-Film. Two years later, along with Hitler’s appointment as Reich Chancellor, the first German democracy came to an end. Just as aspects of Wilhelmine cinema carried over into in the Weimar period after 1918, certain pre-1933 stylistic principles and production strategies found their way into the Nazi Film. But the majority of individuals who, whether behind or in front of the camera, left their stamp on Weimar cinema had no future in the “Third Reich”. Why Wai & Hong Kong Cinema Lead The Way. © 2008 IndyVisible – Entertainment & Cinema News Source and Aggregator. All Rights Reserved.